The newborn baby kangaroo showing its face from its mother Miyuki’s pouch at the Okinawa Zoo and Museum in Okinawa City on February 14. 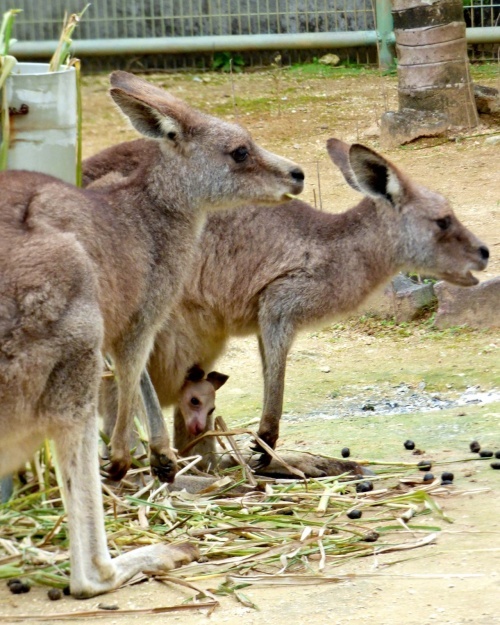 Giant Kangaroo, or Macropus giganteus, Miyuki gave birth to her fourth baby in the Okinawa Zoo and Museum in Okinawa City. The newborn baby kangaroo has frequently been showing its face from its mother’s pouch. On January 31, the breeding staff of the zoo saw the baby showing its face from the pouch and confirmed its birth. The baby was thought to have been born the size of a one-yen coin six months ago. It then moved into the pouch and has been staying there ever since. According to a zoo spokesperson, the birth of a kangaroo is formally acknowledged when a baby shows itself from its mother’s pouch. As of February 14, it is not clear whether the baby is male or female. The baby kangaroo weighs about 900 grams and has slight hair growth. While its eyes are clearly open, the ears droop. The baby shows itself from the pouch and plays with the weeds its mother eats. The baby’s father is Uzuki, the only male kangaroo in the zoo. With the newborn baby, the total number of kangaroos in the zoo is now seven – one male, five females and the newborn. The baby kangaroo will stay in Miyuki’s pouch for another six months while it grows.